Stephen King famously has an inability to self-edit and clearly no one in his life to tell him when he’s going on a bit. 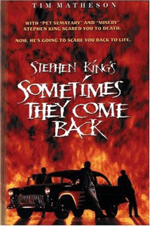 Stephen King’s: Sometimes They Come Back was adapted from a short story by screenwriters Lawrence Konner and Mark Rosenthal but, at times, stands as a good example of King’s tendency to go off to the side of a topic. I first saw this movie in its televised premiere in 1991. My experience with horror movies began and ended with an accidental viewing of the horror movie The Fog (1980) as a small child. I had nightmares for years after seeing that movie and combined with my mother’s adherence to a religion that prohibited television viewing, opportunities to discover if I was a “horror person” were thin. I loved the movie at the moment and would have been hard-pressed to find any faults. I loved the aspect of Jim telling a story that has happened. There’s a weight to the narration that adds to the bleak landscape. When Jim and his family arrive at the ramshackle home the wonderful thrill of what was to come chilled blood. The cold viciousness and cruelty of the greaser character and the promise that they will do what they feel they need to do to accomplish their goal of coming back for good was thrilling. Add in the awesome VW van and you have a hit. In preparation for this review, I rented the movie from our local Family Video. As the movie was set in the early 1970s, it does hold up in the regard to the framework of the piece. Tim Matheson had 30 years of acting experience before taking on the role of Jim Norman. His portrayal of the young house painter turned teacher is at times much better than the script he’s acting. There are tie back moments where commercial breaks would have been plotted. The actor playing the young greaser tapping his cigarette on his hand and calling back the memory of the boys responsible for the death of Jim’s brother, Robert Rusler, is easily recognizable now from his subsequent television work. The moment he and Jim meet in the classroom his “Live and in person, Mr. Norman” is wonderfully casual. It would have been less than realistic for Jim to come back to his hometown where a horrible tragedy happened to his family in his youth unscathed. He is an angry man. His brother died at the hands of monsters and he’s never really come to terms with that loss. His anger will serve him well or destroy him when he returns. Is he telling us the story from beyond the grave or did he survive the horrible experience we know is waiting when the thugs return? Much of the dialogue is trite but the roles are played well enough to make Stephen King’s: Sometimes They Come Back a compelling entry into the Halloween must-see list. Watching as an adult I can see many times when the fat could have been trimmed and perhaps the horror element enhanced. At its core “Sometimes They Come Back” is a good story with constant tie-backs within itself. I do love a good dose of cheesy and this movie has those moments in spades but instead of making the production laughable it adds to the charm of the piece.